Deepwater was different. The failure of the containment equipment on the sea-bed of the Gulf of Mexico let loose a chain of disastrous consequences. 11 workers on the drilling platform perished in the initial explosion; 4 million barrels of crude oil were pumped out over 83 days, an amount larger than any other oil spill in history. But the accident was also different because that oil was pumping out at such great depths - over 5,000 feet below the waves. No previous oil spill has happened so deep, and the consequences for the marine environment are essentially unknown. But a new study, published today on the online version of Proceedings of the National Academy of Sciences, is lifting the veil on one of the more poorly understood aspects of the spill - the 20 mile-long plumes of oil discovered 3,000 feet below. As part of the work, a team of scientists, mainly from the Woods Hole Oceanographic Institution, conducted daring sampling directly from the turbid oil stream erupting from the shattered well - right there on the sea-floor. One of the major controversies as the Deepwater disaster unfolded, was exactly where all the oil was going. Some of it was reaching the surface, to be skimmed or burnt off, or to wash up on Louisiana's beaches. But the volumes were nowhere near what was thought to be spewing out from the Macondo site at depth. With the discovery of drifting plumes of oil, thousands of feet down, that mystery was partly resolved. But a worry has been, what will happen to all this oil dissolved beneath the surface. Will it be digested in a frenzy by the petroleum-gobbling bacteria of the Gulf, perhaps helping to create oxygen-poor dead zones? Or will the dissolved petroleum products linger, contaminating the dark, deep waters that much of the small fry, and crustaceans, of the Gulf call home? To answer those questions, a team of chemists and oceanographers set to work, rapidly deploying innovative technology on-site - to try snare as much information as they could about the spill, at depth, as the well was still furiously leaking in June. That included the use of a recently developed sub-sea mass spectrometer, hooked up to an underwater vehicle called a Sentry. That fed back information on the presence of hydrocarbons to the team on the surface, as they searched for oil plumes. 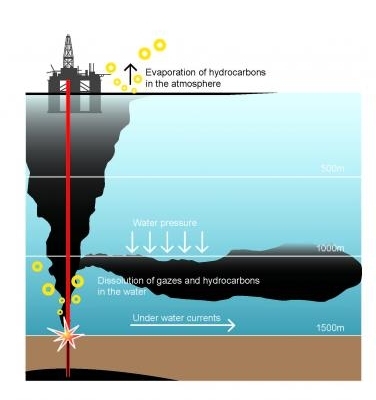 Image Caption: This is a graphic explanation of escaped petroleum dispersion 1,000 meters below the sea. It also included using something never before tried - an isobaric gas-tight sampler, previously reserved for getting hot fluid samples from deep-sea hydrothermal vents. This was rigged to a deep-sea robot known as an ROV (remotely operated vehicle), which was then used to collect the two samples of oil direct from the flow thundering out of the broken well. Using such a sampling device was essential at those depths and pressures, as team-lead Chris Reddy explained. 'It had to hold pressure - a small bubble of methane at 2200 psi is a very big bubble of methane when you bring it to the surface - so the sampler had to be made out of titanium.' In order to extract the sample, the team had to operate untested equipment, with only a narrow window of opportunity. So the successful retrieval of the samples was a major coup. 'It's a very valuable sample, that many people are interested in seeing,' said Reddy. The analysis published today will help to set a baseline for how the components of the oil moved their way through the environment - whether as surface oil slick, the tarry deposits still washing up on the beach or in the plumes roiling around the Gulf. The samples taken from plumes further out have helped to lower some of the concerns about the environmental consequences of the spill - whilst opening up others.